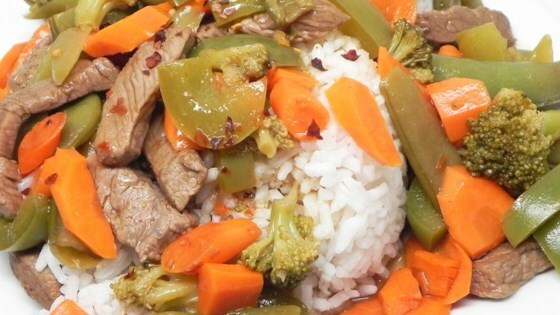 "This sweet and spicy steak stir-fry is tasty!" Heat sesame oil in a large skillet over medium-high heat; cook and stir steak in hot oil until browned, about 5 minutes. Transfer meat to a plate and return skillet to stovetop. Cook and stir broccoli, snap peas, carrots, and bell pepper in the same skillet used to cook beef until vegetables start to become tender, 5 to 7 minutes. Transfer vegetables to the plate with the meat; return skillet to stovetop. Stir wine, honey, dark soy sauce, and red pepper flakes into skillet, scraping up any browned bits from the bottom of the skillet. Stir beef and vegetables into wine mixture; simmer and stir until wine sauce is reduced, about 10 minutes.